*DNA suggests possible species or subspecies structuring; not yet formally recognized. Pelage: Short, shoft, wooly hair covers the body. Back golden brown; belly creamy yellow or orangish. Range: Neotropical; southern Mexico to Bolivia. Habitat: Inhabits closed canopy forests. Prefer undisturbed sites in mature stages of development. IUCN Status: Least Concern (2015 assessment). Widely distributed and adaptable to a degree of human land-use change; no evidence of significant population declines. Other Designations: Mexican Red List species; given special protection. Population in Wild: No published estimates of population size; numbers are likely decreasing. Locomotion: Jump and climb through the forest canopy. Highly adept and agile, the tail is often used to secure and balance the body when crossing gaps between supports. Activity Cycle: Nocturnal; kinkajou sleep during the day and search for food at night. Nightly forays typically last for 8-11 hours and end prior to dawn. Social Groups: Most often solitary, kinkajou are known to associate in small groups. Typical groups are composed of 1 female, her offspring, and 1-2 adult males. 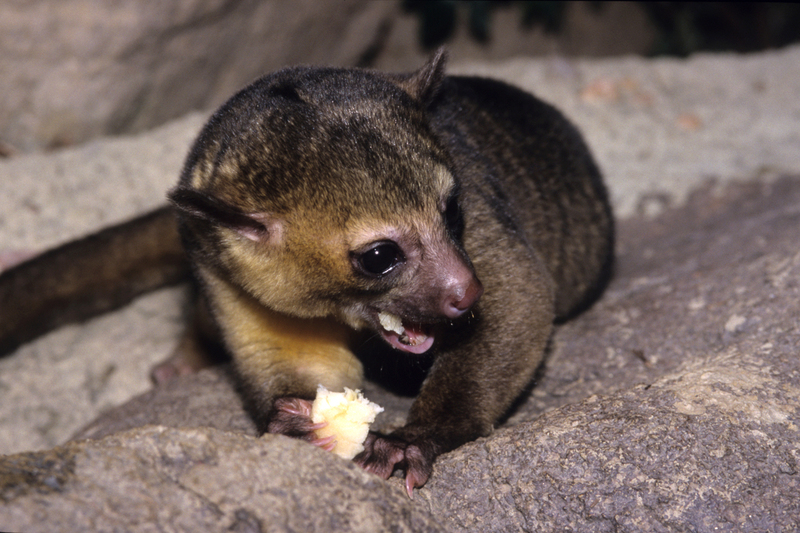 Diet: Frugivores; fruit makes up 90% of the kinkajous' diet. Flowers, leaves, honey, nectar, and insects are also eaten. Jaguar, puma, ocelot, Harpy and Isidor's eagles, and humans. Feature Facts: A prehensile tail and other monkey-like features might mislead the casual observer (or even early well-known scientists) to confuse the kinkajou with a primate; in fact these curious creatures are more closely related to raccoons. This grasping tail helps individuals more easily through forest canopies in their Central and South American homes. Most often solitary, individuals forage for fruits at night and spend daylight hours at sleep in tree top dens. A female and her young are sometimes joined by one or more males; these small groupings often den together and may be seen feeding in close proximity to one another. © 2015-2019 San Diego Zoo Global. Updated January 2015. Taxonomy updated Apr 2019. How to cite: Kinkajou (Potos flavus) Fact Sheet. c2015-2019. San Diego (CA): San Diego Zoo Global; [accessed YYYY MMM DD]. http://ielc.libguides.com/sdzg/factsheets/ kinkajou. Many thanks to Dr. Roland Kays for providing content review of this fact sheet. Dr. Kays is a zoologist with broad research interests. He is a recognized expert in his field and known for applying new technologies to study free-ranging animals. His work has provided valuable information on hard-to-study species, including the kinkajou. At the time of this writing, Dr. Kays serves as Director of the Biodiversity Lab at the North Carolina Museum of Natural Sciences and is a Research Associate Professor at North Carolina State University.